"Ways to Look at a cup of water"
The Buddha taught this essential Truth: our lives are shaped not by things that lie outside of ourselves but by our own selves; to be more precise, by our own minds and way of thinking. Let’s see what the Buddha meant by turning to the well-known example of a cup that is half full of water. 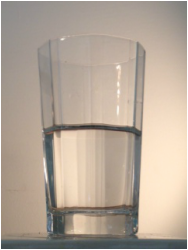 First, a pessimist looks at that cup and sees it, as you’ve guessed, as being half empty. Second, an optimist sees that same cup as being half full. Third, a Buddhist sees it as simply being a “half a cup of water.” In short, he or she sees it as-it-is, without any kind of further comment or judgment. Fourth, a Shin Buddhist, from the perspective of Faith, views that half-a-cup of water as a gift and a source of gratitude. For in his or her humility, which is an integral part of Faith, he or she is fully aware that all things—from the food that we eat to the clothes we wear and to the water we drink—are not produced from within but are given to us as gifts from a source outside of ourselves. So the pessimist tends to create a gray and unhappy world. The optimist, a bright world, but he or she may run into trouble when that cup becomes empty and bone dry. The Buddhist will no doubt lead an enlightened life that may, however, lack a certain human warmth.